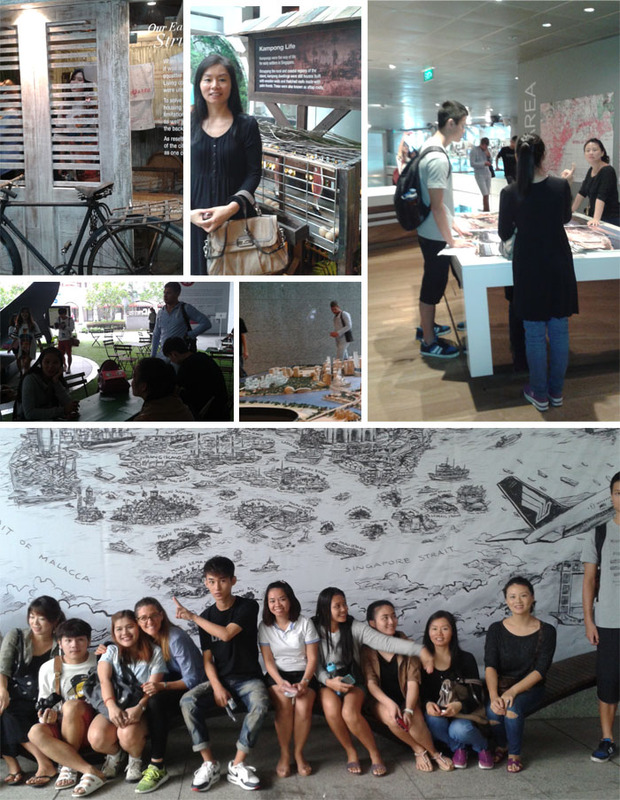 On December 11th 2015 the Upper Intermediate class visited Singapore City Gallery. The gallery is situated in Maxwell Rd and is an easy bus ride from school. Admission is free. 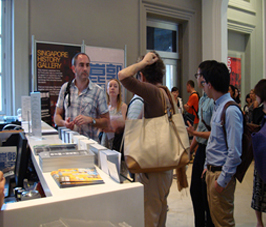 Activity sheets and topics for discussion are downloadable from the Singapore City Gallery website. The purpose of the ECA was for the students to gain an understanding of the development of Singapore over the last 50 years and the planning processes in place for future development. This aligns with Unit 9 of the Course Book relating to buildings and cities. 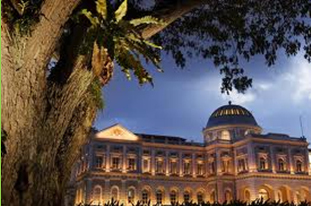 The Singapore City Gallery has 2 floors of permanent displays and interactive exhibits explaining the growth of Singapore to date and also projections and development planning for the future. The students completed two activity sheets during the visit and followed up with a group discussion in class. All agreed that the Gallery was a very enjoyable and informative place to visit and the interactive nature of the exhibits made the information accessible for ESL students. 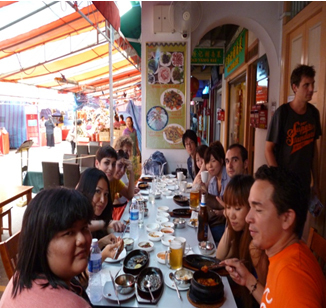 The class went on a trip to Little India on 4th November to learn a little on the culture of Deepavali. The topic of Deepavali had been discussed in conversation class and this gives an opportunity for students to truly experience the vibes of the celebration. We started with a lunch at an Indian Banana Leaf restaurant where students got to try cuisines from North and South India. After lunch we went on a walking trail around Little India and visited the Deepavali bazaar at the Little India Arcade and the temple where one of our Indian students took the liberty of explaining the practice and the many God statues that was seen in the temple. A worksheet (Appendix A) for students were given but due to time constraints, we were not able to follow the exact route. 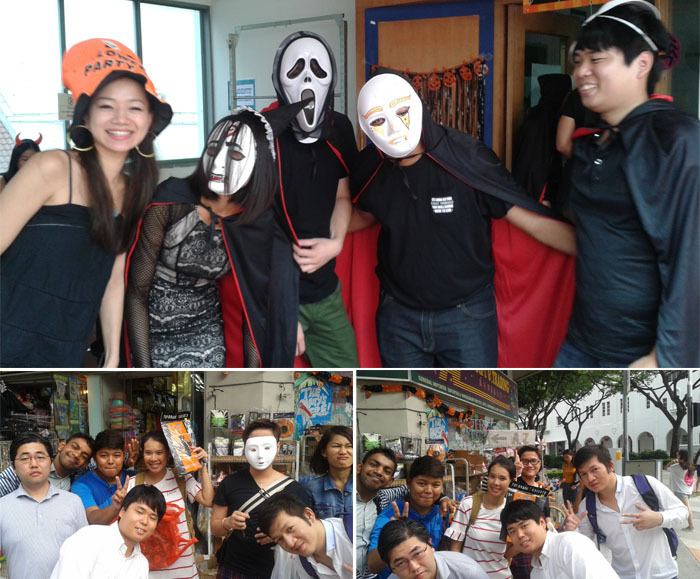 On October 28th 2015 the Pre Intermediate class went shopping for Halloween costumes at the costume shops on Middle Rd. This is an easy bus ride from Clarke Quay. 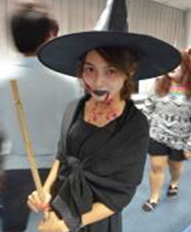 The purpose of the ECA was for the students to practise the functional language related to shopping and also vocabulary related to Halloween. 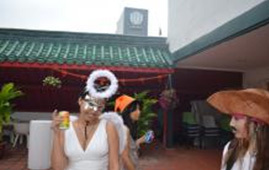 This aligns with Unit 7 Function Globally and the Ascend Halloween Party. The students enjoyed the trip. Most bought costumes for the party and the class was able to agree on a costume theme for the party once they saw what was available and got some ideas. The students completed two activity sheets before the ECA and followed up with a group discussion in class. Start your journey at Little India MRT Station (NE7 on the purple North-East Line). Take Exit C (Bukit Timah Road). Look around, and if you’re lucky, the Chinese fortune teller who sits along the walkway of Block 663 will be there. Walk along Bukit Timah Road towards Serangoon Road. This is one of Singapore’s oldest roads. It was built to cut across the island. 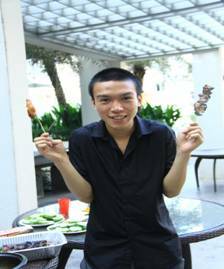 The name Serangoon comes from a bird, called rangon by the local Malay villagers. 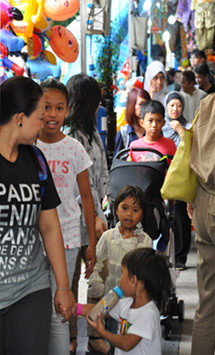 Today Serangoon has many busy shops. As you stand at the corner of Bukit Timah Road and Serangoon Road, look across Rochor Canal, look for Ellison Building on the opposite corner. This old building is an architectural gem. Built in 1924, it is widely believed that British governors of Singapore once watched Sunday races at the race course from the semi-circular domes. Walk along Serangoon Road towards Buffalo Road. Long ago, there were many buffalo pens here. There were also many snake charmers, fortune tellers, astrologers, palmists, numerologists, even parrot-astrologers here. 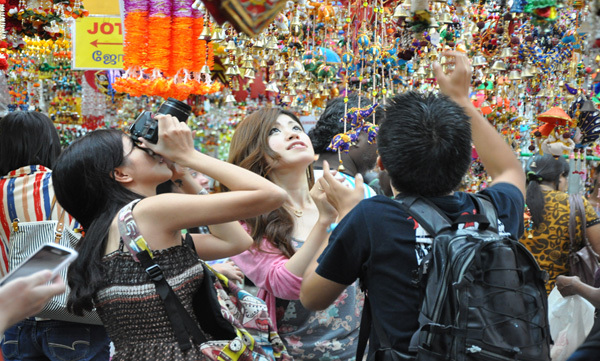 And during religious festivals, people would look for them to ask them about the future. 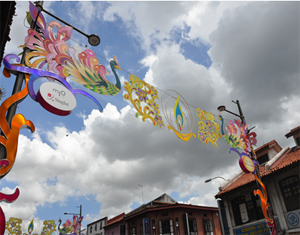 Look for Race Course Road, which was named after Singapore’s first race course which in 1843. You can learn more about the area’s culture and traditions. What can you find in these shops? Check out the walkway. See how very decorative the floor tiles are. Spend some time exploring the ethnic stores; then stroll past the beauty parlours, jewellery and silk stores here to reach Serangoon Road once more. At No. 37, you will see the House of Tan Teng Niah, one of Little India’s last surviving Chinese villas. Admire its gorgeous architecture. 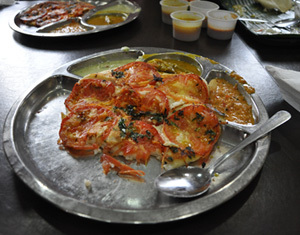 If you are hungry and keen to try some Indian delicacies like appom or thosai, try Ananda Bhavan at No. 58 Serangoon Road. You might find some great souvenirs! Leave the Little Arcade’s side entrance on Campbell Lane . This road is very exciting during Hindu festivals like Deepavali, when a lively bazaar spirit fills the air. 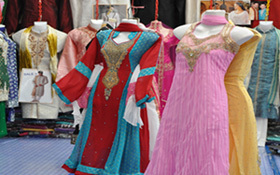 That’s when sellers sell traditional handcrafts and garments, jewellery, carpets, food, spices and flower garlands. Also on sale are finely crafted gold altars and figures of Hindu deities at Gokulam. Can you find a flower garland shop? 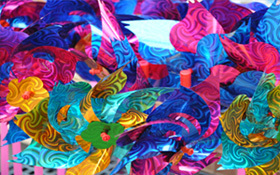 What flowers do they use to make flower garlands? Next head to Dunlop Street via Madras Street. As you walk along, admire the various shophouses’ styles on the street; No. 127 and 159 are examples of early shophouse style. 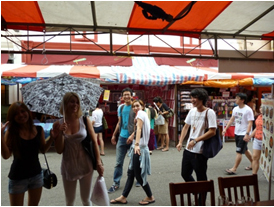 Spend some time browsing among its mix of provision and textile shops. You’ll soon reach the entrance of the Masjid Abdul Gafoor. At the entrance of this mosque is a sundial. Look at its design. What does it look like? You can enter the mosque, but please take off your shoes. Next, head to this church on Perak Road. It was completed in 1952. Early worshippers here were mainly trishaw riders who lived and worked in the area. The church also provided them free medical care and a kindergarten. Today, religious services are held in English, Mandarin and Tamil for their multi-lingual worshippers. Here you can view some interesting details of the area, including Peranakan shophouse, which marry a unique blend of Straits-born Chinese and Malay influence. Also located on this street at No. 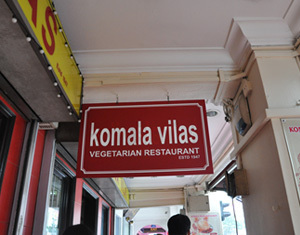 330 to 332 is Komalas, Little India’s first Indian fast food restaurant. And usually, sitting on the right corner, you’ll see an Indian fortune teller with her small green bird. Some of the jewellery pieces have ancient patterns, and the Noavarethinam, a ring encrusted with nine different gems. It represents the nine planets in our solar system, the ring is mainly worn by men, supposedly to counteract the influence of these planets. Turn the corner into Cuff Road. Nearby, at No. 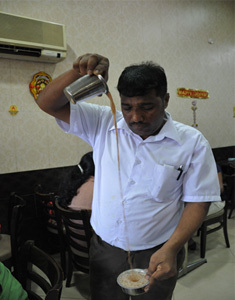 2, is one of Singapore’s last Traditional Spice Grinders. People used to believe spices should only be grounded during the day to keep its freshness. Today, fewer families practice this; many buy their spices ready-ground. 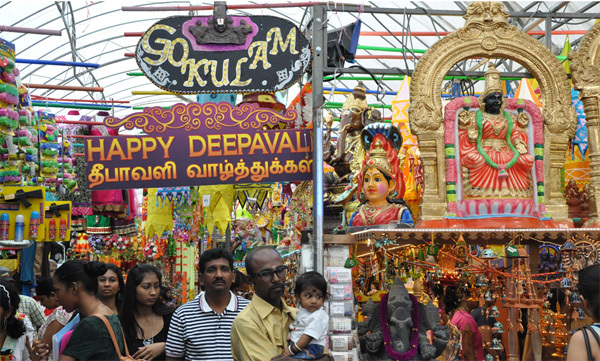 Now cross Serangoon Road over to the Sri Veeramakaliamman Temple. This temple was built as early as 1855. It is for Kali, the Goddess of Power. Can you find her statue in the temple? What colour is it? Do you see the devotees doing any rituals? What are they? Devotees entering the temple ring the many bells on its door, hoping to have their requests granted. Inside, the ceiling is rimmed with statues of Hindu gods. And of course, at this temple’s main shrine is a jet black statue of Kali, flanked by her sons Ganesha and Murugan. The many-armed Kali carries many weapons too. Namely, weapons of destruction. Ganesha, the elephant god, is the Remover of Obstacles, while Murugan, often depicted riding a peacock, has his birthday marked by the festival of Thaipusam. At other shrines, elephants flank the staircase, while the steps are covered by intricately-worked silver. Veeramakaliamman means Kali - the Courageous. And during World War II, the temple courageously offered refuge to many. Tuesdays and Fridays are the holy days when the temple is abuzz with religious fervour; a sight to behold. You’re welcome to visit then, or at any other time (the temple is closed 12.30pm to 4pm daily) but please enter barefoot. Congratulations. You have completed the walk. 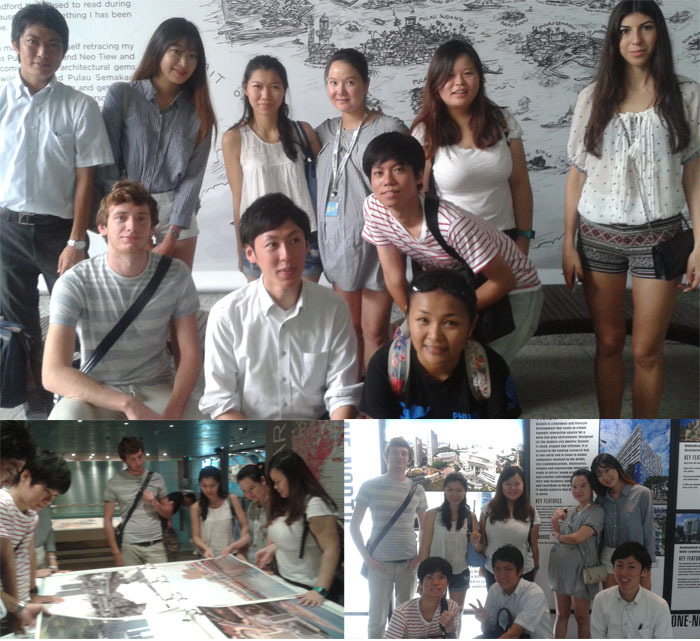 On September 10th 2015 the Upper Intermediate class visited Singapore City Gallery. The gallery is situated in Maxwell Rd and is an easy bus ride from school. Admission is free. 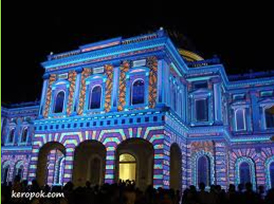 Activity sheets and topics for discussion are downloadable from the Singapore City Gallery website. The purpose of the ECA was for the students to gain an understanding of the development of Singapore over the last 50 years and the planning processes in place for future development. This aligns with Unit 9 of the Course Book relating to buildings and cities. 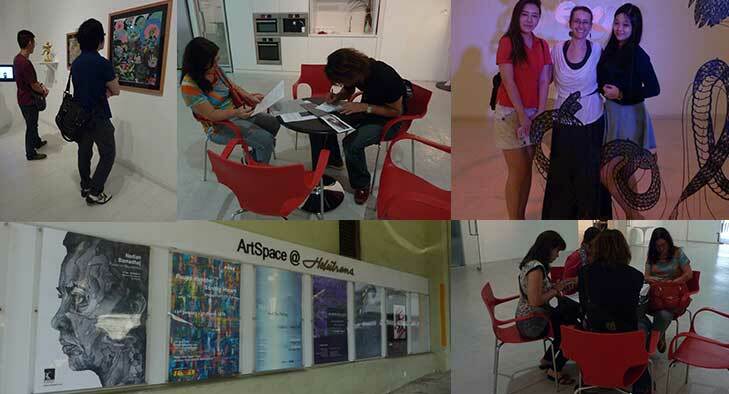 At the time we visited there was also a temporary exhibition, “Our city, our place “ on Level One of the Gallery. This was a very interesting collection of exhibits depicting the development of Singapore over the last 50 years. 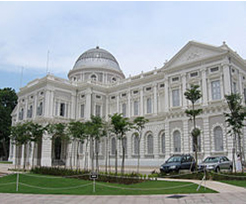 The Singapore City Gallery has 2 floors of permanent displays and interactive exhibits explaining the growth of Singapore to date and also projections and development planning for the future. The students completed two activity sheets during the visit and followed up with a group discussion in class. All agreed that the Gallery was a very enjoyable and informative place to visit and the interactive nature of the exhibits made the information accessible for esl students. 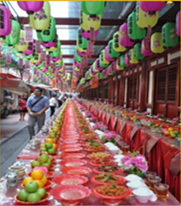 Elementary students visited Chinatown to experience Chinese New Year traditions and festivities. 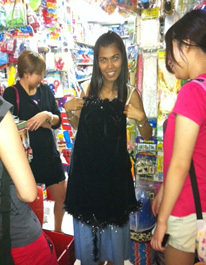 It was also an opportunity to practise functional language related to shopping. 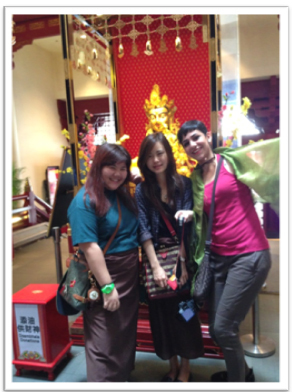 We started by visiting the Buddha Relic Tooth temple. 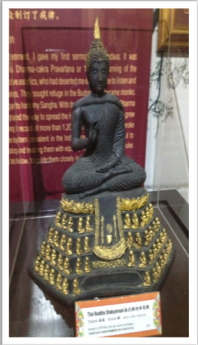 This unique temple includes the Buddha Relic Tooth museum on the third level where the tooth itself is housed in a gold stupa. 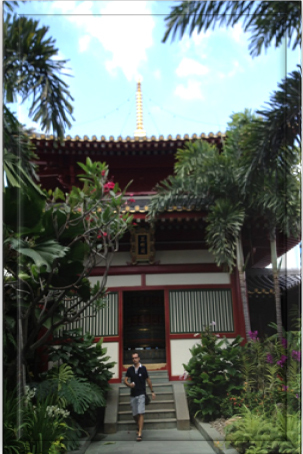 On the fourth level of the temple is a beautiful tranquil garden and an enormous prayer wheel. 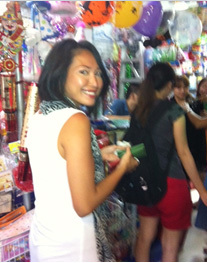 After visiting the temple we went across the road to a Chinese Medicinal Store which is famous for Birds Nest products. A gallery at the back of the store provides an interesting visual display explaining the harvest and processing of birds nests. Finally we arrived at the Pagoda Street market area and enjoyed the busy out door markets selling traditional Chinese New Year decorations and food. 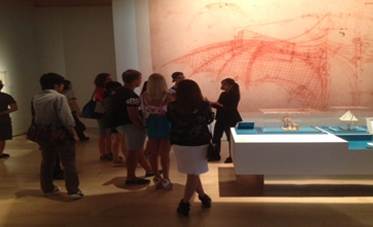 On February 28, 2015 we visited the Leonardo Da Vinci Exhibition at the Singapore ArtScience Museum. Our primary interest was to learn more about Da Vinci’s work and life. 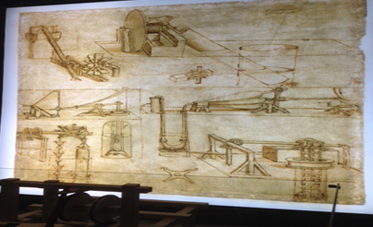 Da Vinci: Shaping the Future is a journey through the work and legacy of the artist and scientist, Leonardo da Vinci. 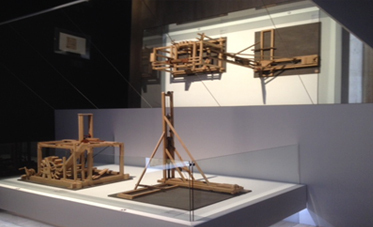 The exhibition presented original masterpieces by Da Vinci for the first time in Southeast Asia. The exhibition focused on the Codex Atlanticus, da Vinci’s largest notebook. Students were encouraged to use the language learnt in Modules 3 and 6. 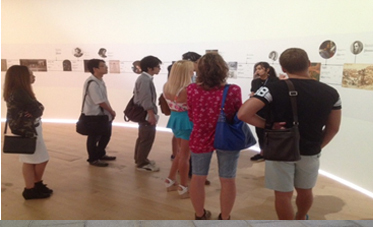 They practiced listening skills as a tour guide took them around the exhibition. They also had a worksheet related to the Da Vinci Exhibition to complete. Overall, the reactions from the students were very positive as most of them were impressed with what they saw and learnt at the Exhibition. On February 27, 2015 we visited Chinatown. Our primary interest was to learn more about the Chinese New Year Festival and to practice the language learnt in class. 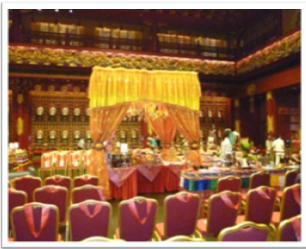 First we visited the Buddha Tooth Relic Temple. Many students seemed impressed with the beauty of the temple as well as the museum and garden on the higher levels of the temple. After that we visited a Traditional Chinese Medicine shop which is famous for its authentic medicinal products such as birds' nest and ginseng. Students had the opportunity to ask questions and get information related to the products. They also looked at the pictures displayed in a gallery at the back of the shop which showed how birds' nest is processed. 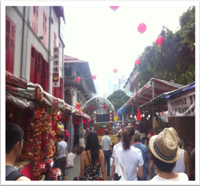 Lastly, we went to the beautifully decorated streets and its open-air stalls in Chinatown where students were able to get an impression of what the Chinese New Year Festival is really about. On Friday the 14th of March at 12:30pm, all the classes gathered in the lab and conversation rooms on level 5 to watch and participate in the Positivity Rocks Event. A total of 20 individual and groups entered the speaking category. These brave students stood up before the school and read and recited famous positive quotes and beautiful uplifting poems to the appreciation and applause of their friends and teachers. The art/making category and the writing category each received 7 entries. These are displayed in the lab. Photos and videos of the event will be posted on Teamie soon. Robin and the student council did an excellent job of hosting and organising this event. The winners will be announced on Teamie soon! 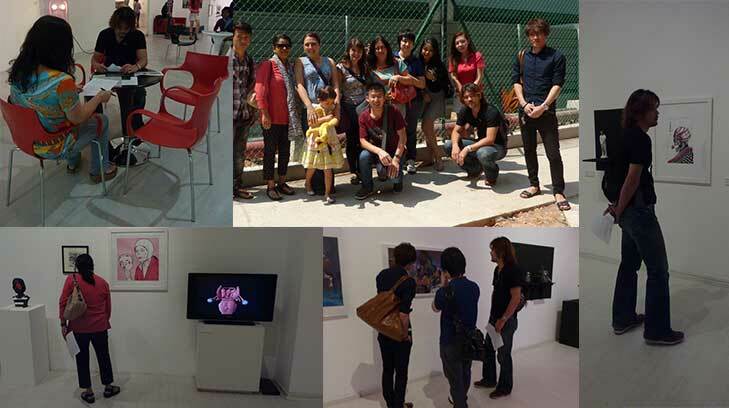 On the 28 th of February 2014, we, Ielts students visited the art gallery which is located near Tanjong Pagar and we got inspired by many beautiful works of art. me think about various things. I never get tired of looking at it. I think this art looks cute and adorable, and it brings me many happy childhood memories. 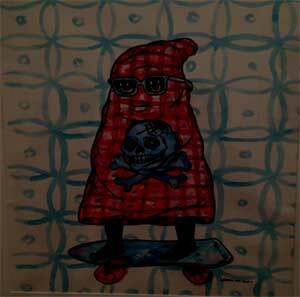 However, my friend, Randy said that it looks scary for him as it has a skull in the middle. I was very impessed by the painting as the colour of black and white work well and perfectly togther, however, my friend, Yuzo said that this painting reminds him of a natural disaster -Tsunami so he doesn't feel comfortable when he looks at it. 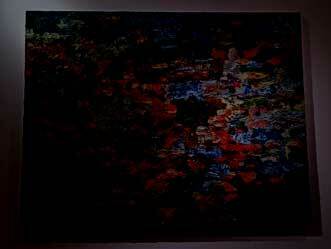 This painting cost more than SGD $10,000. Four of us have the same opinion that this painiting is not worth this price. 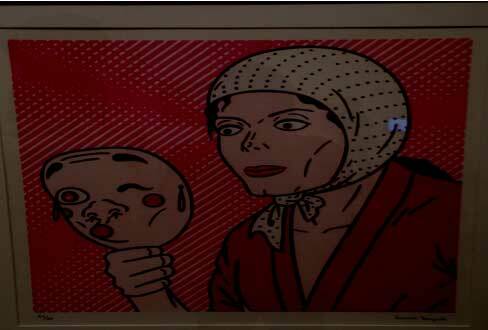 In conclusion, we feel that it is hard to measure the worth of art by money. Eventhough I don't like this kind of art, this sculpture looks weird and strange, but I think it is very unique and curious, but Koya felt scared when he saw it for the first time. 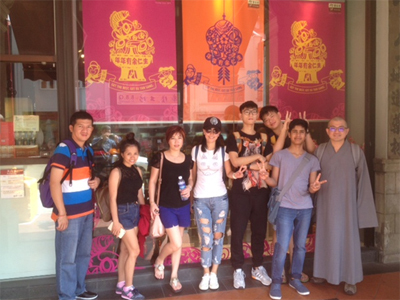 On Thursday the 28th January 2014 from 11am to 2pm a small group of students and a teacher went to see the Chinese New Year decorations in China Town. After meeting at school at 11am the group took the MRT to China Town station. There they were given a task: Create a short video diary about Chinese New Year. 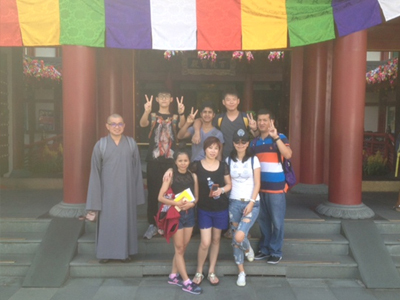 The group explored Pagoda Street, went to the Chinese Temple, got Henna tattoos done before making wishes for the New Year at the Wishing Tree. The outing ended with a lovely Korean BBQ lunch. While the group waited for the food to arrive they looked through the videos and pictures and tried to accumulate 10 points for their task. They managed 8/10! On the 23rd of January 2014, students gathered around the level 5 terrace, from 12:30 pm to 2pm, to decorate Chinese New Year Dragon posters for display around the school. 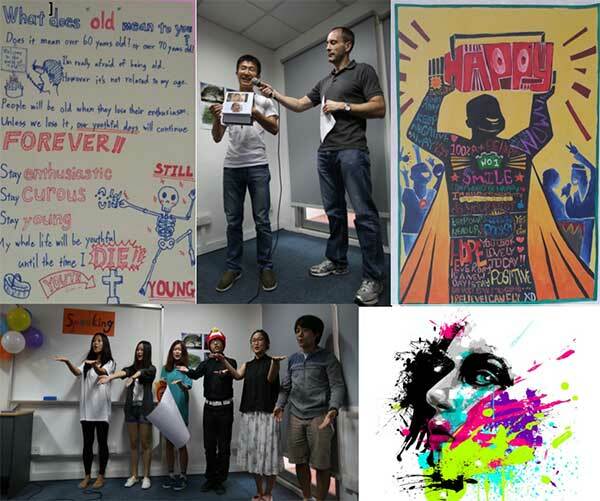 This “ART” event formed part of the School’s “EXPRESS YOURSELF” theme for Term 1, 2014. A lot of fun was had by all and the posters look AMAZING!!! Many thanks to all the teachers and students who worked to make this event such a big success. The posters formed part of a competition and the winners were the students from Intermediate. 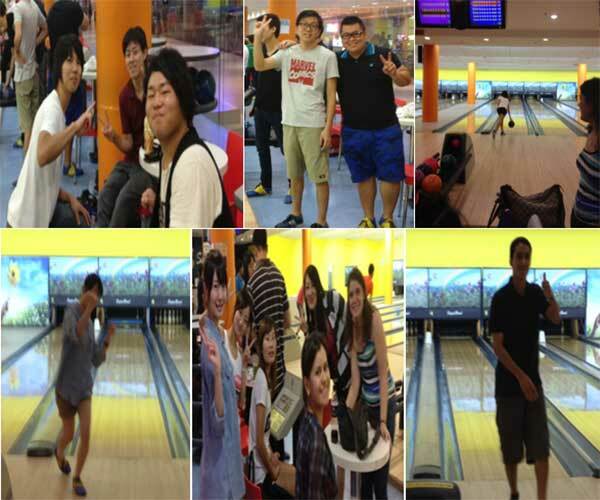 For our final ECA of the year, 16 of us (including myself) went bowling at Marina Square Superbowl and had a GREAT time! We were there at about 2.45pm and didn’t have lanes available (unfortunately) but all that was very quickly sorted out. The 6 ladies there started bowling first and they were ‘bowling up’ a storm! Strikes, spares and a load of laughs and fun! The men showed their competitive sides. Splitted up into 2 lanes, they bowled impressive scores. You would have thought they do this every day! Well, after class, of course. It was great. I think the students definitely enjoyed the activity. Hopefully, there’ll be more to come! 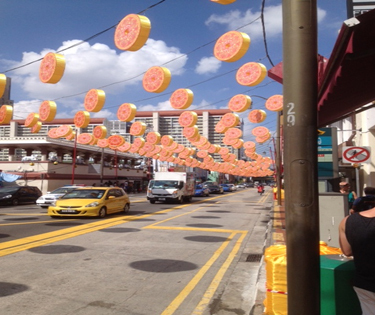 On Friday 25 students, Jane and Vini went to Little India to experience the Deepavali preparations. This formed part of a unit relating to festivals and celebrations that the Elementary and Pre-Intermediate students had been doing in conversation class. We bought some traditional Indian cookies and decorations and took lots of photos. Some of us finished the day with a refreshingly cold drink. 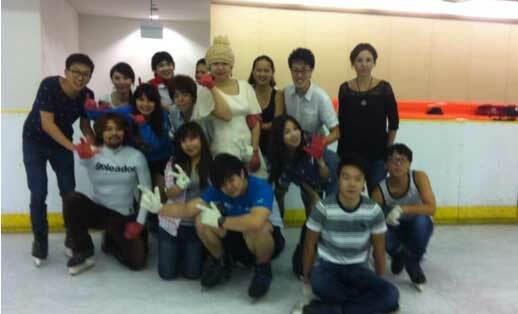 On Friday the 22nd November 2013, Zee and Lisa met up with a group of about 16 students for some fun on ice. This ECA event was organised to tie in with this term’s campaign on Fun and Festivals. The group first shared some snacks at the food court before spending 2 hours laughing, falling, and learning to skate together to the background music of Christmas carols! A lot of fun was had by all. This Halloween was another fantastic time! 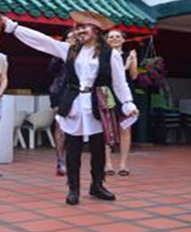 It started off with a mini-parade of students in costume. 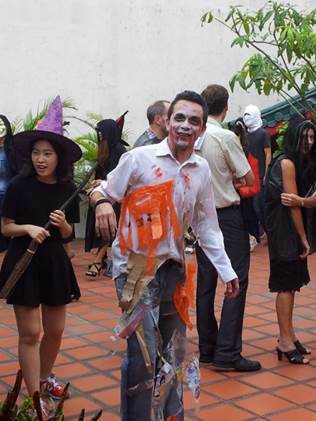 The teachers chose for Best Dressed: William, for his clever use of GARBAGE as part of his zombie costume; Scariest Dressed: Onu, for a strange mix of make-up, hair, and jump suit and Funniest Dressed: Takuye, for having a mummy head ONLY! The parade was followed by a great performance of Thriller by William and the dancers. All those rehearsals definitely paid off! 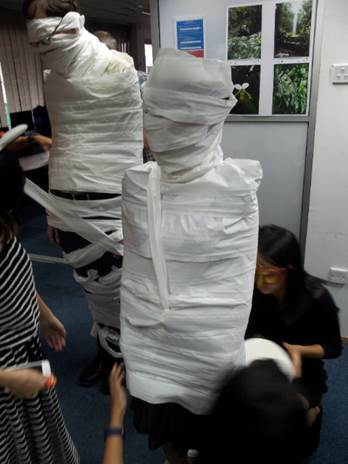 Then all went inside to cool off and join in the MUMMY WRAP, in which teams of 4 (1 mummy and 3 wrappers) fought to wrap their mummy completely in the shortest time (played to What does the Fox Say?) Teachers chose two tied winners for the best mummied student! The festivities closed with Tim thanking the student council for their hard work (meetings, furniture moving, balloon blowing & cleaning). 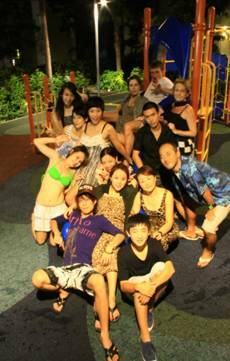 Special thanks were also given to William (choreographer) & his dancers and Kevin for their marvellous performances. 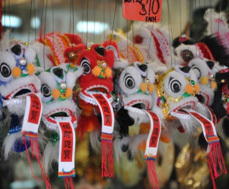 Friday 1st February 3 teachers and 24 students plus a few ex-students set off to Chinatown to experience and take in the atmosphere of Chinese New Year. Chinatown was full of people and everything was decorated in red and gold and there were many lanterns. There were of course also snakes. An unforgettable day for me - spending such a precious time with all my friends in Chinatown. 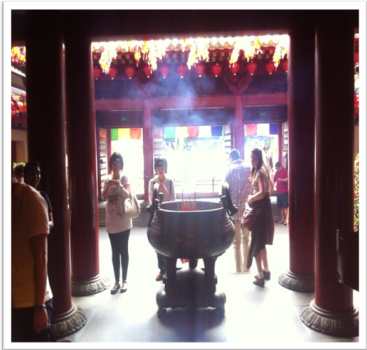 As you can see in the photo, there is a gorgeous Chinese temple and for me that was an opportunity to know other culture. 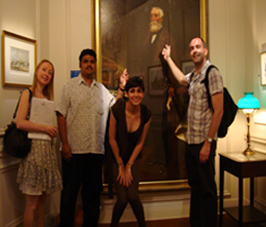 One if the most interesting tours that I had in Singapore. 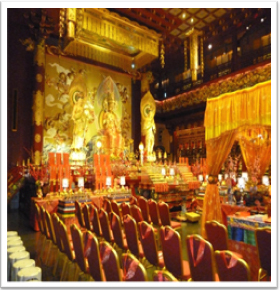 And the atmosphere inside the temple was so inspiring. Bew, Ling and Ana in the Chinese temple in Chinatown. A lovely roof garden in the Buddha Tooth Relic temple in Chinatown. It is full of orchids and really peaceful. On the 4th floor was also a prayer mill. We tried it. It was such a happy day for me. After the temple visit we went to have lunch but there were so many people so got separated. So we had lunch in smaller groups, but ran into each other many times during the afternoon. We went to Chinatown. There were so many people so we got lost. But the lunch in the food court was so delicious. 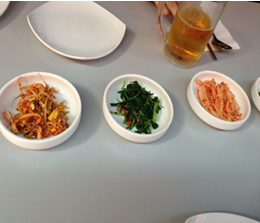 We ate Korean food in Chinatown. It was oishi! It was such a happy day for me and for all my friends. Teacher: "Do you know how to count from 1to 10?" Nilofa: "No, I forgot that teacher.. he, he, he ..."
Let's se who can point this picture higher then me!" Robin: "Wow, I am the winner!!!" Thea: “I’ve got 4 votes." “When I arrived at the exit, there wasn’t any students, so I thought that I lost direction > I couldn’t find another exit. 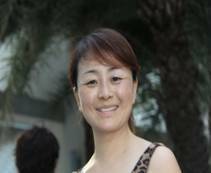 Singapore history, film, food, fashion and lifestyle. 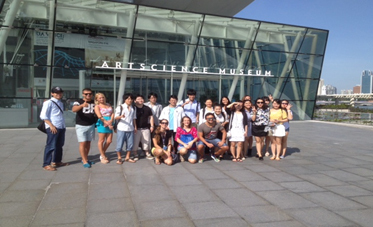 Thirty five or our students from different levels - Intermediate, Pre-Intermediate, Elementery and Starter – went to the National Museum of Singapore in the afternoon. We left Ascend Education Center 3.40pm. In great spirit and to our surprise and joy we found out that students with student passes could get in for free - great start. We were all given a ‘companion’ – a listening device - which would tell about the great variety exhibits, in different languages. The students enjoy the visit. They enjoyed learning, discovering, recognizing some of the exhibits. 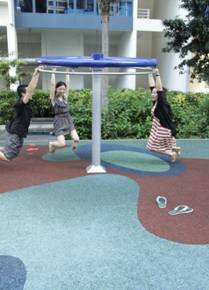 They enjoy being out of the class room, talking to each other across the levels and just having fun together. We finished the visit at about 6pm and some of us went for dinner together. A good start on our monthly film evenings TAKE FIVE. 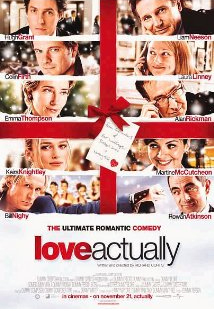 We screened the funny, Brithsh Christmas film "Love Actually"
Some students were kind enough to help me load the DVD, find the subtitles, the volume, etc. Thanks to them. A paper with a list of characters (there are confusingly many) and a short vocabulary list were given to interested students the day before. 24 students turned up and they seemed to enjoy the film and being together across class levels and countries. Afterwards some of us discussed the film over dinner and drinks. All in all, a really enjoyable evening!!! Every country has it's own festivals. 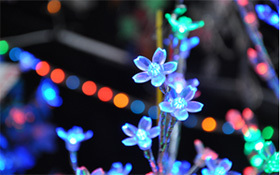 Deepavali is one of the biggest festivals in India. During this festival the streets are filled with traditional decorations, flowers and lights and you can hear traditional folk-songs. An unforgettablel day with friends and teacher To become a healthy person vegetables are inevitable. 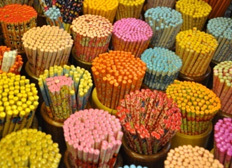 They are colourful and powerful. 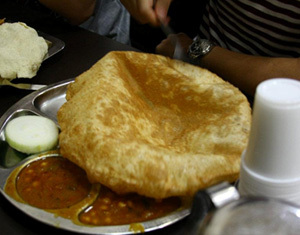 Cone Dosai and Bhattura – very delicious kinds of Indian bread with all kinds of dip – spicy but good. 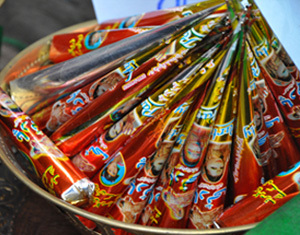 Teh Tarik and the art of making it..
Henna art is very impressive and traditional The price of a henna cone is $5 per piece. 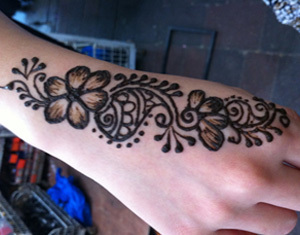 The beautiful henna art work is also $5. The henna artist drew fascinating pictures by free-hand. March. Upper Intermediate. 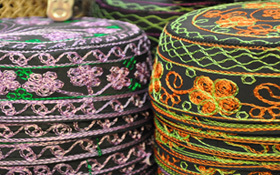 Here are some examples of the henna art work – beautiful, isn't it? they were all there at the Halloween party on the 5 floor. Great party, great costumes, great games and great food. 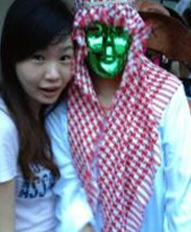 The Pre -Intermediate, Intermediate and the Starter classes went on a Halloween shopping tour on Tuesday, 30th October. The group of 16 students and 2 teachers (Vinitha & Zee) set off after lunch to shop for Halloween costumes and masks to wear for the party scheduled on 31st October. 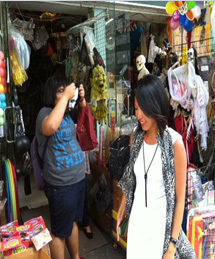 The students were really excited to see the variety of Halloween merchandise available in the shops. They really had a difficult time deciding what to buy!! There was a lot of interesting talk about Halloween and how it’s celebrated in various places. Students tried on different masks and other accessories. On the whole, it was a very enjoyable and productive trip. 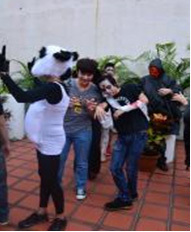 The students went home excited about the Halloween Party the next day. We had talked about ‘Halloween and its history in the earlier conversation classes and now the students were able to relate to the symbols and accessories they saw in the shops. 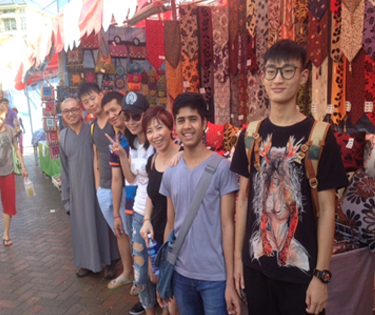 On Friday 21st August the Pre-Intermediate & Intermediate 1 conversation classes, and one student from Advanced Conversation class went to Chinatown in search of Hungry Ghosts. 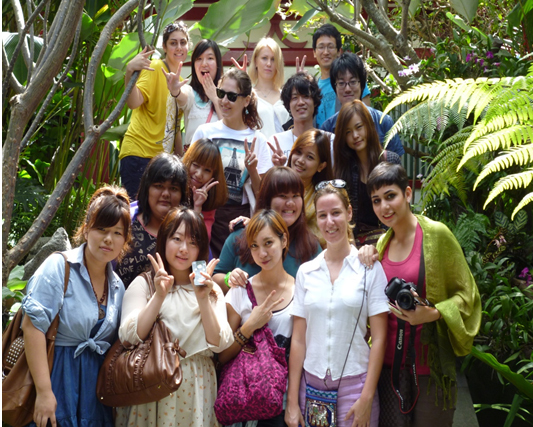 We had talked about the festival during previous conversation classes and now we went out to see for ourselves. First we walked around in the streets of Chinatown and these are some of the things we saw. We saw this frog made of coins in Chinatown. There was lots of food for the hungry ghosts. 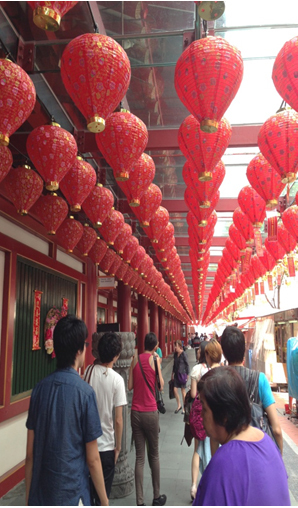 Two streets with setting for 200 hungry ghosts and one hungry students – me. Marco, Int. 1. We saw this frog made of coins in Chinatown. Before we went into the tempel Lisa from Pre-Int was praying for her family to be sound and safe. 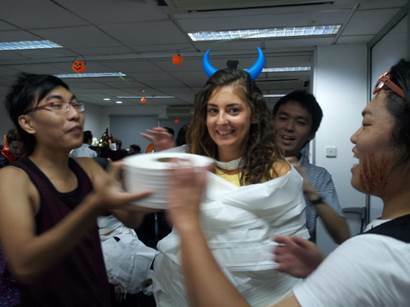 Lisa is from Vietnam and they also celebrate Hungry Ghost Festival there. Erica, Adv. The monks were chantin loudly for the hungry ghosts. Veronika, Pre-Int. 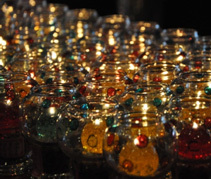 The candles in the glass cups were labled with names of dead people. They are put on the tables but before people light them they them they are saying aprayer to Buddha. Lisa, Pre Int. 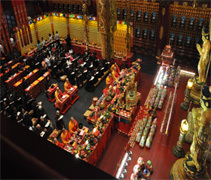 Many people were praying to Buddha in the Chinatown Tempel, Teja Pre-Int. All in all, it was a very interesting and exciting experience and Lisa and Erica, who are both Buddhists, told us a lot about what was going on. Captions were made by the students and the photos were provided by Pati. 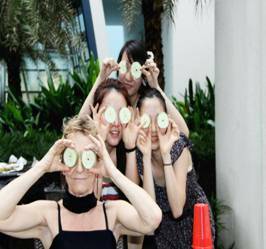 At lunch conversation class Intermediate 1, Pati, Raquel and Li Jingjing set off to experience the Hari Raya atmosphere in Geylang Serai. Hari Raya marks the end of Ramadan, the month when Muslims fast from sunrise to sunset. 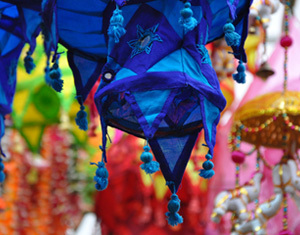 After 30 days of fasting Hari Raya is a very happy, colourful and fascinating festival. Muslim families dress in the same colour and go to the street bazaar, where you can buy everything from traditional food and drinks, flowers, handicraft, beautiful dresses and suits cushions to Persian carpets. 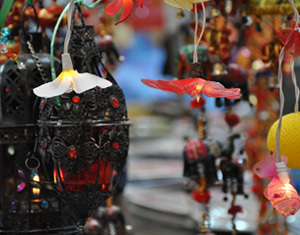 Went the last day of Ramadan – the day before Hari Raya and the bazaar was full of people shopping for colorful lights, flower decorations for their homes and most importantly clothes for the Festival. Some of the traditional dresses for the women in this moment of the year. 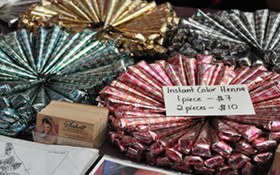 Here is some henna to make tattoos. 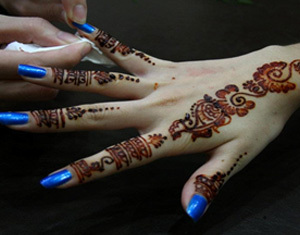 There are many kind of henna for your hair, on the hand or others parts on your body. Here is a lady is doing Henna tattoos at the hand of the lady. A man cooking the meat. 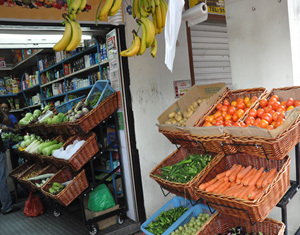 In the central market of this temporal market at Paya lebar. 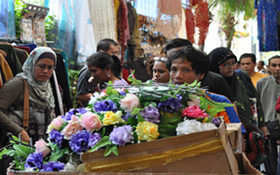 Someone carrying a cart with many flowers for decorating the streets. There are a lot of thing one of this it's was the toys for the kids. 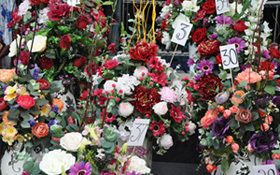 Flowers: We saw many different kinds of flowers around the stands and shops, from the Hari Raya. They're in different colors some are red or yellow, but all of them are beautiful. I like when people use the flowers for decorating their houses with flowers for the new year. 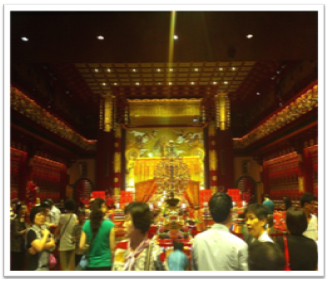 After having discussed Vesak Day and Buddha’s enlightenment in the conversation classes we visited the Buddha Tooth Relic Temple and Museum in Chinatown. The outside of the temple was beautifully decorated with lots of cherry blossom and hundreds of lanterns in all shapes and colours. 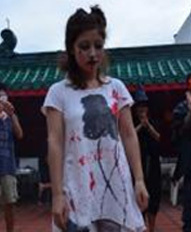 Students in short, short skirts and bare shoulders had to put on ‘sarongs’ and shawls. The first thing we did in the entrance Hall was to find out our Chinese Zodiac sign by looking at the charts and images of the 12 zodiac signs. 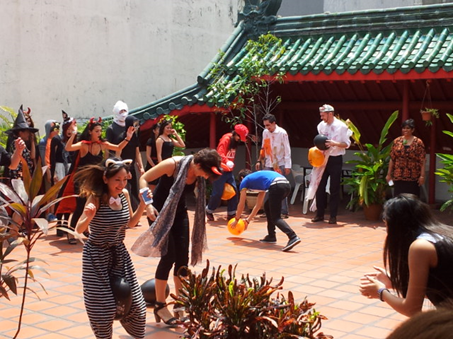 Due to the recent Vesak Day there were lots of activities going on in the main temple halls on the ground floor and the second floor. 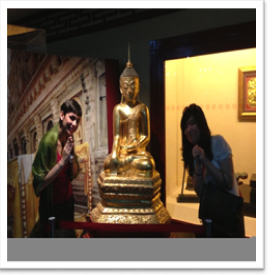 Luckily we had two ‘Buddhist‘students, Ivy and Kook Kai (Int. 1) who could tell us a lot about what was going on. 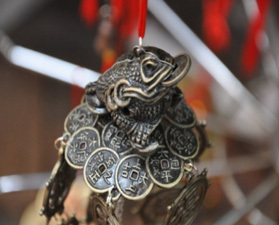 The visit sparked of some discussion the following day in conversation class about the Chinese Zodiac signs and the characteristics connected with the twelve signs. Beginner, Elementary, Pre-Intermediate 1, Intermediate 1 and Up-Intermediate 1 went to the Titanic exhibition. Most students enjoyed the exhibiton especially because we had worked with material about Titanic and and watched the film. The students were very eager to find out what was reality and what was fiction in the film. Especially the bow of the ship, where Rose and Jack stood, the promenade deck with the calm water below and the stars shimmering in the dark, the 'famous' staircase, the first class cabin, and the 'real' iceberg was of great interest to the students. Another exiting thing was the tickets, which were copies of real bording passes with peresonal information about real passengers. Each student got a boarding pass and could check their accomodation (first, second, third class) and at the end they could check if they were one of the 705 lucky ones who survived. All in all a great, intereting outing which generated further discussion during the following class. Jane and Vinitha took four conversation classes comprising about 40 students, including some part-time students who opted to join the ECA. The students had read about and discussed various aspects of the Titanic disaster before the ECA. 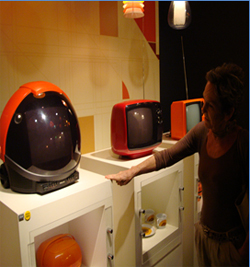 At the exhibition they completed a quiz based on information that could be gleaned from the displays. The exhibition was very interesting and the recreation of parts of the Titanic eg. The Promenade Deck and the Grand Staircase, very realistic. At the entrance to the exhibition we were given a Boarding Pass with a passenger’s name and booking details on it and the students were able to check the list of names at the end of the exhibition to see if they had survived or not. A very enjoyable and worthwhile ECA which generated a lot of material for use in class both before and after visiting the exhibition. e of us went to have a bite, a drink and a chat at Blu Jaz afterwards. Jane and Vinitha took Pre-Int 1 Intermediate 1., Upper-Int. 1, Elementary and Starter classes. to Sri Thendayuthapani Temple to experience the Thaipusam Festival. We were able to see the kavadi carriers arrive in the temple and proceed to the area were the spikes were removed. The students subsequently made excellent presentations (using visual aids) of the trip in the form of posters and slide shows. All in all a very enjoyable, educational outing where students from different levels were able to interact with each other and observe this unusual Hindu festival. Intermediate 2 had a great BBQ party at Vicky's place. We met at the Farrer Rd. MRT station 3pm and went shopping for food and drinks (a lot). 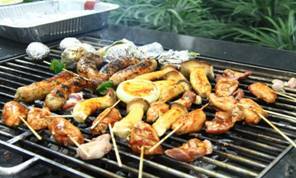 Later we BBQed and played on the playground (for children – we are big children) and in the swimming pool. It was a great evening. Vicky's Mum had prepared some very spicy marinade for the meat. It was so spicy we had to drink a lot. Vicky's Mum, Amy Sooo spicy and sooo good. 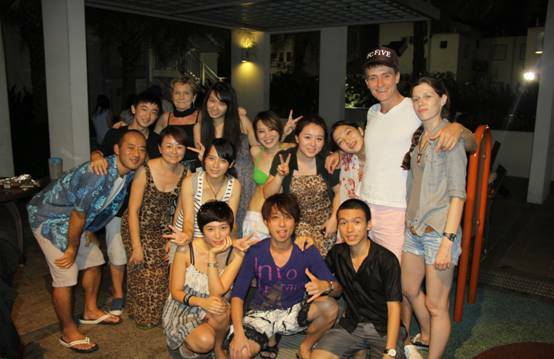 The reason for the party was that 5 of our class-mates are leaving, so; Farewell Evgeny and Elena from Russia. Farewell Long from Vietnam (going back to university). Farewell Vivian from Shanghai (planning her wedding here in Singapore). Farewell Yuka from Japan (going back to continue high school). Very funny Yuka. 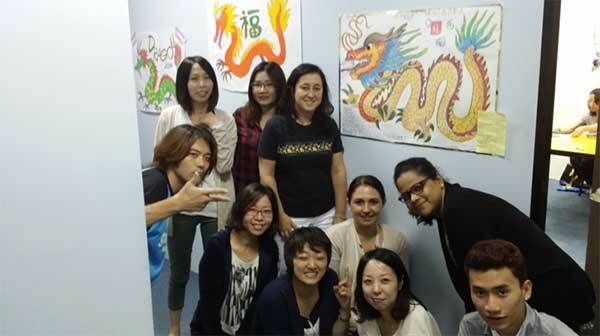 From, Annie (teacher), Vicky (China), Jessie (Taiwan), Melissa (Malaysia), Joy (Korea), Tyler, Jun (Japan). Vicky's Mum, Amy and Vicky's brother, Lucky. Unfortunately a few couldn't join, Hiroko (who was sick), Amelia, Sue and Hanh (who had birthday that day – we didn't know). 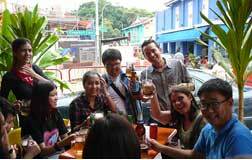 A lot of English was spoken that afternoon and evening and many promises of keeping in touch and e-mailing each other (practice English). Memories of a 'crazy' class.